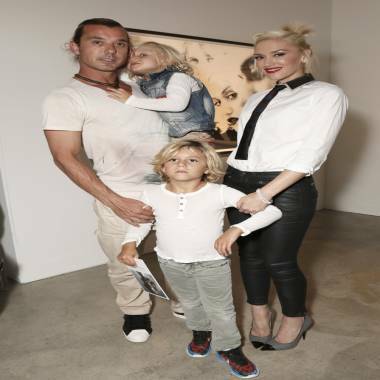 Gavin Rossdale and Gwen Stefani with their sons Zuma and Kingston in Los Angeles in June. Gwen Stefani and rocker Gavin Rossdale have been married for a decade and the No Doubt frontwoman takes great pride in their longevity as a couple. “A miracle,” she told the October issue of Marie Claire of staying together for so long. “My biggest accomplishment is my marriage so far. Because it’s hard, everyone knows it’s hard. The couple has faced their share of tabloid rumors touting the demise of their relationship over the years, but Stefani said they are still going strong. Stefani said one of the things she loves about her husband is how smitten he is with his music superstar wife. The couple is parents to two boys -- Kingston, 6, and Zuma, 4 -- and Gwen revealed the boys are bundles of energy. Gwen would like another child, but said she’s also happy if their family numbers stay the same.